Good afternoon. Bună Ziua. Thank you Governor Isărescu for that kind introduction. I am very grateful to you and the Romanian government for inviting me to your enchanting country. 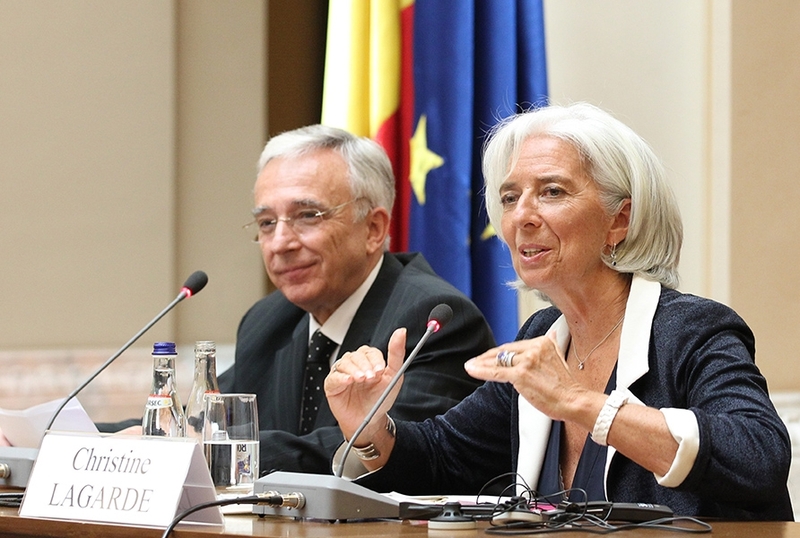 It is a great pleasure to be here in beautiful Bucharest, for my first visit as IMF Managing Director. As I traveled around the city yesterday and today, I felt very much ‘at home’—Bucharest is after all sometimes referred to as ‘little Paris’! Yet what struck me most is how ‘at home’ Romania is within Europe. Your paths are forever intertwined. The idea is simple—by coming together, all Europeans could prosper and flourish. This principle continues today as Europe looks East, and Romania and her neighbors look West. Romania epitomizes the goal of an open and inclusive Europe. Romania is at the heart of three regions: Central Europe, Eastern Europe, and the Balkans. It is where three worlds meet, not to collide, but to converge. First, the global context: where the world economy stands today and where it is headed. Second, your neighborhood: a look at how far Eastern Europe has come and the lessons for deeper integration. Third, Romania and the path forward to thrive, not just to survive, as part of Europe. So, globally, where do we stand? 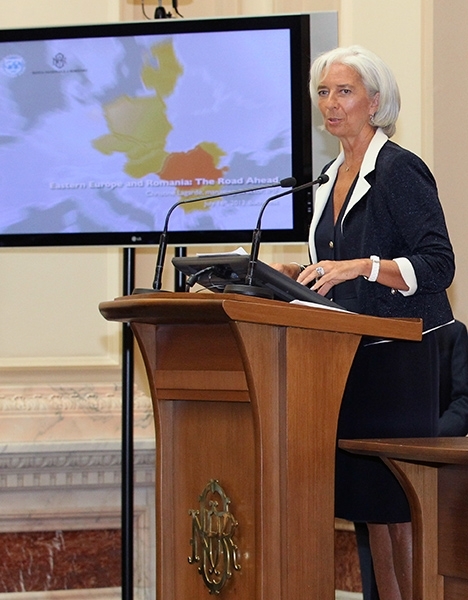 Last week, the IMF released its updated outlook for the world economy. I certainly would not characterize it as bad news, but I do wish the news could have been better. The good news is that the most extreme risks seem to have passed. There are, however, still too many speed bumps in the road to strong and sustained global growth. Overall, the global economy should expand by around 3.1 percent this year, the same as in 2012. This is a fraction weaker than we had anticipated a few months ago on account of two factors: the continuing recession in the euro area—where growth still in negative territory to the tune of 0.6 percent—and also weaker than expected growth in many key emerging market economies. Still, emerging markets and developing economies will be a source of relative strength for the global economy, with 5 percent growth this year. There are also other pockets where growth is generally on the right track. I have in mind the United States—although the large fiscal tightening is holding back growth. That picture is also clouded with risks, old and new. There are the familiar worries that the situation in Europe could get worse before getting better, as well as the pending issue of the U.S. debt ceiling. There is also a risk that the growth slowdown in emerging markets could last longer than we expect. This partly reflects developments at home, such as tighter credit and structural constraints on growth, but also external factors, including weaker global demand and financial stability concerns. Another watch point for advanced and emerging economies alike is the risk that current market turbulence could continue and deepen. A key consideration going forward is the unwinding of unconventional monetary policy, where careful phasing and clear communication will be critical. These developments serve to remind us of where the focus should be: people, policies, and partnerships. Here, in this region, you understand these interconnections. They are part of your history. This brings me to my second main point: how the experiences of this region over the past two decades can help chart a course to successful integration and lasting shared prosperity. Remember how far you have come. Recall the historic transformation of the past two decades. As walls came down and doors to the west were opened, the countries and people of this region were changed forever. The year 1989 was a great inflection point for the region—and for Romania—turning decisively to more open economies, more modern institutions, and Europe’s embrace. Together integration and reform delivered rapid growth. Between 1995 and 2007, Eastern Europe grew faster than all other emerging market regions, with the exception only of China and India. You know the story well. Countries rode the wave of exports, lifted even higher by an incoming tide of capital flows that quickly followed. Of course, there is another side to the story. The influx of capital and credit ultimately fueled too much demand. And fiscal policies fanned, rather than quelled, the unsustainable pace of growth. This saw current account deficits reach double-digits in many countries; for some going as high as 25 percent of GDP. Then the crisis hit in 2008, exposing your economies, and your people, to heavy losses. Growth turned sharply negative, with double-digit declines in many countries. Now, five years after the start of the crisis, the worst has passed. Most of the countries in your neighborhood have returned to growth, along with Romania. This year, we expect only two countries—Croatia and Slovenia—to remain in recession, compared to eight last year. What do I take away from this? The lesson is certainly not to turn your backs on European integration. Yes, integration brings risks. These can be managed. Yes, Europe has been facing one of its greatest trials. These can, and must, be faced together. I firmly believe that integration is a big opportunity and the right future for Eastern Europe. Taking a long view helps us answer the question: is Eastern Europe better off today than a decade or two ago? Clearly the answer is yes. Average incomes have tripled in the past two decades, from about US$3,000 in 1993 to more than US$10,000 today. If I were to draw one central message from this, it is that you are in charge of your own destiny. You can harness the power of integration to achieve lasting growth and job creation. One, ensuring macroeconomic stability. Many countries have taken the difficult step to rein in public fiscal deficits. About a year ago I visited Latvia. It is a good example—last year Latvia had a budget surplus compared to a deficit of nearly 8 percent of GDP in 2009. That said, about half the countries in the region still have deficits over 3 percent of GDP and public debt has been rising. So it is important that countries are committed to continuing this progress. Two, ensuring that the burden of adjustment is shared fairly and other actions are taken to support growth. Easy monetary policy has been an important cushion in this region—and elsewhere—while keeping inflation expectations firmly anchored. Another aspect of this is to find a way, even in the midst of budget cuts, to strengthen social safety nets and protect the most vulnerable. Three, ensuring that growth is lifted to a higher plane. Certainly, slow growth today is partly cyclical, but it also reflects structural roadblocks. Potential growth across the region has slowed substantially since the crisis, from over 5 percent in 2007 to less than 2½ percent in 2012. The roadblocks may differ by country, be it labor markets that do not work well, poor infrastructure, or an unfinished transition process. But the region is united by a common goal—to break down the barriers to more vibrant and dynamic economies, and to break down the barriers to even greater success within an integrated Europe. Let me now turn to my third and final point: how Romania can best capitalize on the opportunities ahead. Your home and your future lies within the European family. At the same time, Romania has even more at stake, more to gain among the countries in your neighborhood. The European Union is an enormous market—the destination for about 70 percent of Romania’s exports and the source of more than three-quarters of foreign direct investment. However, this is more than a simple growth opportunity. It is the chance to improve the well being of all Romanians. With income per capita around one quarter of the EU average, there is much to be gained. Romania is well positioned to make this leap forward. For one, your country has vast economic potential. A potentially abundant supply of natural energy. A strategic location on the Black Sea that provides a view beyond Europe. As well as an energetic and largely untapped workforce. Labor market participation is among the lowest in the EU at 64 percent, and lower still for women. Romania has successfully stabilized its economy after being hard hit by the crisis. This involved difficult decisions, but the country took ownership of the problems and delivered an impressive reversal of previously unsustainable macroeconomic imbalances. In the space of three years, Romania reduced its fiscal deficit by more than 6 percent of GDP, and has exited the EU’s Excessive Deficit Procedure this year. Certainly, a big part of this story is the strides Romania has taken to transform its institutions and strengthen decision-making with EU membership. In this same spirit, strong cooperation and partnership has also been a hallmark of Romania’s successful stabilization. The Vienna Initiative is an excellent example of how public and private partners coordinated to avoid large scale withdrawals from the banking system. 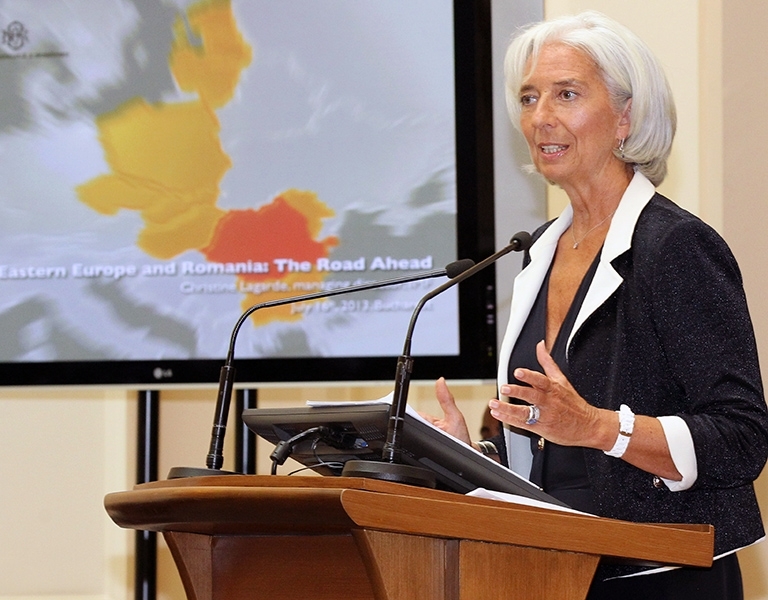 I am proud that the IMF has been at Romania’s side, providing both financial and technical support along the way. We very much look forward to taking our partnership forward. Of course, it was your commitment and your determination that brought Romania this far. These efforts have created a platform for growth and I am confident that Romania can stay the course. The focus now is how to take the economy to the next level. The priority is to pursue plans for structural transformation to make sure that Romania can not only survive, but will thrive as part of Europe. Your country deserves credit for taking steps over the past several years to begin chipping away at the barriers to higher growth. Here, I would highlight the impressive steps toward liberalizing energy prices. The IMF recently published a study on this issue and Romania’s approach has the hallmarks of a model approach: gradually liberalizing prices, while also better targeting social assistance to mitigate the impact on the most vulnerable. There are however other reforms that can boost competitiveness and put Romania on a permanent path to higher and more inclusive growth. What kind of reforms do I mean? Reforms that support job creation and employment along with continued efforts to improve social protections for the most vulnerable. Improving the quality of energy and transportation infrastructure, for example, by enhancing the viability of state-owned entities and creating an environment where the private sector invests in those sectors and helps raise efficiency. Improving the climate for investment is not just oriented to the private sector. Steps to improve Romania’s ability to effectively use EU funds for efficient public investment would also support growth. Above all, the path to greater prosperity requires determination. If the crisis tells us anything, it is that policy actions take time to create change and generate growth. On that note, let me leave you with one final thought. Romania’s future is a shared future: shared by the generation of young Romanians you are determined to give a better future and shared by the European family of which you are a part. There is a saying in your country “Unde-s doi, puterea creşte”. It sounds beautiful. Both in melody and in meaning it reveals something very profound about your country. In English this translates as “where there are two, the strength rises”, or more loosely “we are stronger together”. We hear this strength in the harmonious blend of Latin and Slavic heritage. Romania is both undeniably unique, yet also profoundly European. As part of the European family, as part of the global community, Romania can go from strength to strength.